There are different types hip replacements. If a hemi-arthroplasty is performed, either the femoral head or the hip socket (acetabulum) will be replaced with a prosthetic device. In a total hip replacement, both the femoral head and the hip socket is replaced by the prosthetic device. In a total hip replacement surgery, the painful parts of the damaged hip are replaced with artificial hip parts called prosthesis, a device that substitutes or supplements a joint. The prosthesis consists of steel components: a socket, ball, and stem. The outer shell of the socket is usually made of metal and the inner shell consists of plastic, or the entire socket may be plastic. When the metal ball is joined with the socket, the new hip can allow for smooth, nearly frictionless movement. 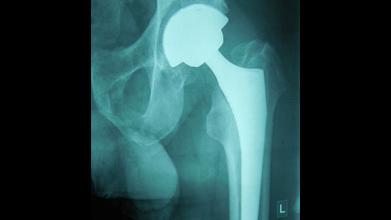 Hip replacement is currently the most common orthopaedic operation. If you have difficulty walking or performing everyday activities such as getting dressed, it may be time discuss hip replacement options with your Medical Provider. Generally try to delay total hip replacement for as long as possible in favour of less invasive treatments. However in patients with advanced joint disease, hip replacement offers the chance for relief from pain and a return to normal activities. If you are having any of these signs below, it is recommended you to speak to your rheumatologist or orthopaedic surgeon about the possibility of joint replacement: Unable to sleep at night because of hip pain. Medications don’t help alleviate the pain or the medication you have been on no longer works. If you feel that the pain from your arthritis is keeping you from regular outings such as visiting friends, going shopping or taking a vacation. If your activity is restricted to the point where you have trouble getting out of a chair, going up stairs, getting off the toilet or getting up from the floor.